Sleeping like a … fruit fly? Matthew Thimgan, assistant professor of biological sciences at Missouri S&T, and his students are studying the sleep patterns of the Drosophila melanogaster, aka the common fruit fly. The insect gives them a way to identify genes and pathways that regulate sleep and to learn about how sleep deprivation affects health and performance. 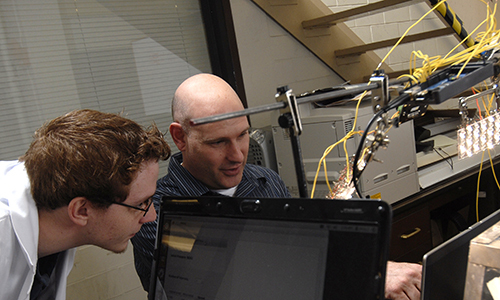 Barton and Dr. Matthew Thimgan (right) in the biological sciences sleep laboratory. Thimgan says he chose the fruit fly for a number of reasons. Because many of the molecules that govern sleep and wake cycles are similar between flies and humans, he can use genetic “tricks” to manipulate those genes. 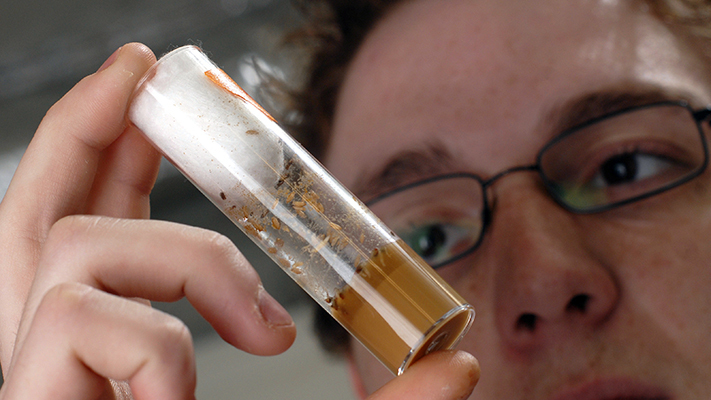 Fruit flies also have a short generation time — just 10 days from offspring to adult. “Not only do they sleep at night like we do, they even sleep with the lights on — that’s how strong the sleep drive is,” he says. A few years ago, Thimgan identified a new pathway that influences sleep regulation, lipid metabolism. He discovered evidence that lipid metabolism genes, which help store and release fat, may play a role in regulating sleep. He found that when the lipid metabolism gene was mutated, the sleep-deprived fruit fly no longer appeared sleepy and was able to continue normal learning after a night of sleep loss. The group is now exploring creating mutations in another gene to disrupt sleep. They have ways to increase the flies’ anxiety so they can evaluate how their bodies manage to regulate their sleep and wake cycles, and how the body is restored during sleep. They are also looking to see if the flies’ metabolism is changed by a lack of sleep. “We’re trying to change attitudes about the importance of sleep,” says Thimgan. “Even if you get enough sleep, others may not — like your doctor, truck drivers and pilots. It can cause all sorts of problems. Dr. Thimgan’s research on sleep patterns of the Drosophila melanogaster (fruit flies) is most interesting! Thank you, Matt, for sponsoring some related interdisciplinary and exciting senior design projects in Mechanical Engineering. It was a big turn-on for our students. Matt and Dillon, great article! And your outreach to K-12 is also very much appreciated. Excellent job!